Russian poet and writer; born at Glubokoye, government of Wilna, in 1855. At the age of twelve Nikolai removed to Minsk and entered the local classical gymnasium (graduated in 1875). The town of his gymnasium course supplied him with his pseudonym "Minski," whereas his real family name is Wilenkin. He began his literary career in 1876, and at once attracted attention by his highly artistic poem "Na Rodinye." This appeared in the best Russian journal, "Vyestnik Yevropy," in which Minski has published most of his poems. "Na Rodinye" is an inspired poetical response to the sufferings of the Bulgarian people when the Russo-Turkish war was at its height. The period of Minski's elementary studies corresponded with that distinguished by the intense striving of Russian society for progress and enlightenment, and those auspicious years were important also for the Russian Jewry. The stimulating influence of the times was also reflected in the Jewish circle in which the future poet-philosopher lived and studied. He obtained his higher education in the department of law of the University of St. Petersburg, graduating in 1879 with the degree of bachelor of law. In that same year he published his best poem, "Byelyya Nochi," which reflects the spiritual life of the contemporary youth with its restlessness and its dreams. The characteristic feature of his poetry is its pessimistic mood; it exhibits a desire to lay bare the misery of life. Very frequently Minski is the poet of sorrow, but this sorrow is impersonal and concerns some hated problem. The first volume of his writings appeared in 1887 and was received with high praise by the critics, who nevertheless pointed out the defects of his verses. A second edition of his book was soon called for. In 1889 Minski wrote a historical drama, "Osada Tulchina," which shows an unusual clearness in character-drawing, a plot of absorbing interest, and an intimate knowledge of the history of the time, besides beauty of style. The drama describes in a characteristic manner the struggle of three peoples—the Jews, Poles, and Little-Russians. 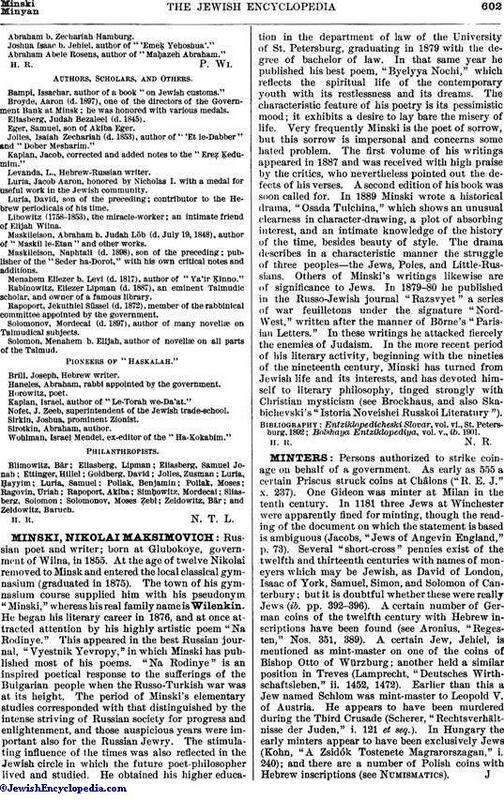 Others of Minski's writings likewise are of significance to Jews. In 1879-80 he published in the Russo-Jewish journal "Razsvyet" a series of war feuilletons under the signature "Nord-West," written after the manner of Börne's "Parisian Letters." In these writings he attacked fiercely the enemies of Judaism. In the more recent period of his literary activity, beginning with the nineties of the nineteenth century, Minski has turned from Jewish life and its interests, and has devoted himself to literary philosophy, tinged strongly with Christian mysticism (see Brockhaus, and also Skabichevski's "Istoria Noveishei Russkoi Literatury"). Bolshaya Entziklopediya, vol. v., ib. 1901.